As the rest of the entire world, I have heard about her for a while, but to be honest I have never stopped and looked closer at her story. So – after a considerable hiatus around here! – I dived into it. Malala is a 19 year old young lady from Pakistan who from a very early age was advocate for the importance of education – specially, girl’s education. In Swat, where she was raised the Taliban began to gain power and to dictated “informal laws” that went till the clothes people wear to the music they listen to. No occidental influence, no television and.. no girl’s education. Malala is the oldest daughter of quite a interesting character – which I believe plays a great part of who Malala became and does not get much credit for how fantastic he is. Ziauddin Yousafzai is an educator who have always dreamed about funding his own school – which he did accomplish with the Khushal Public School, where Malala studied and lived. In her autobiography I Am Malala – an international best seller – I was surprised to read her upbringing in such detail, specially the struggles her dad had for his own education, the perseverance to pursuit his dream in a unstable region with limited resources and the progressive way of life he embraces encouraging even his wife (who was illiterate) to go back to school as an adult. That being said, it is no surprise that in an early age Malala began to distinguish herself from her peers. She was passionate about learning, an enthusiastic to get better, brighter and even a bit competitive with her colleagues to achieve that. Once the Taliban began gaining power and – as she said – disrupting the values of Islam, she had a natural position to stand up for what she believed. Soon the Taliban’s power grew and not only colorful clothes were banned; girls were prohibited to attend schools. There was a clear order to close all girl’s schools and the one who didn’t attend the order were bombed. In September 2008, the 11 yearold Malala gave her first speech called “How dare the Taliban take away my basic right to education?”. She was soon notice by a BBC journalist who invited her to start a blog telling the world how it was being a child and growing up in a Taliban crisis – for security measures, she used the pseudonym Gul Makai. Just like the Anne Frank’s, in Malala’s there is a mix of innocence yet awareness about the deep impacts of terrorism in the life of a young girl who just wanted to go to school, read her books and wear her pink dress when she wants to. After that, she became a voice – young voice, female voice – nationally recognized in Pakistan and, also, to the Taliban. That gave her great accomplishments such as the Pakistan’s first National Youth Peace Prize, a nomination by Archbishop Desmond Tutu for the International Children’s Peace Prize; and, also, made her an official Taliban’s target. 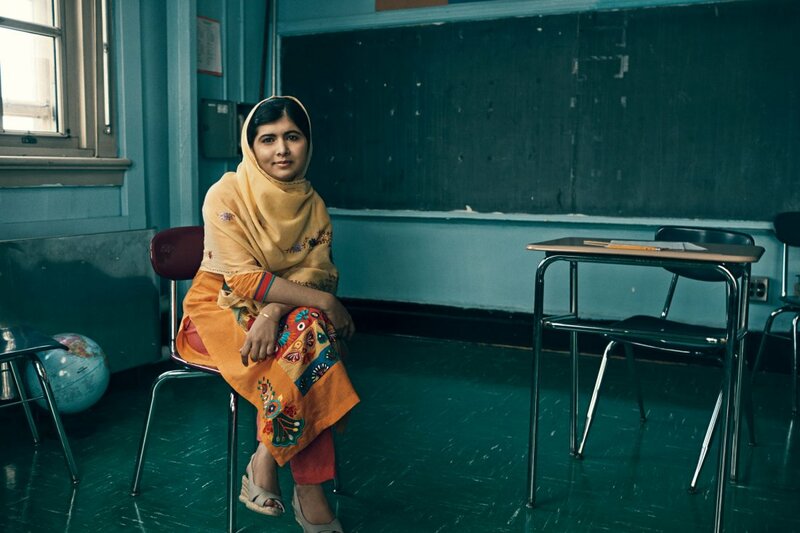 On October 9, 2012 , like any regular morning, Malala was going to school – despite all the Taliban’s orders. She was worried about a test in the upcoming days. Her plans and 15-year-old worries soon changed, when a gunman boarded the bus and asked “WHO IS MALALA?” (by the way, the response, like a little tease, became the title of her best selling book). She was the only one not wearing the burka. She brutally shot in the head and the neck, other two girls were injured. As soon as she got to the hospital and the doctors realized there was a chance she could make it, they knew she was not safe anymore, not even in the hospital. After a few days, her condition also began to get worse since there the hospital did not have an ideal infrastructure so she was transferred to Birmingham, England. She survived her injuries and got even stronger, determined to make a bigger difference and stand up to what she believed. One year later, the European Parliament awarded Malala the Sakharov Prize for Freedom of Thought. That same year, she was nominated for a Nobel Peace Prize for the first time. She didn’t win it, but was nominated again the following year and made history as the youngest Nobel Peace Prize Winner ever at age 17. After the famous speech, the UN committed to provide education to all children through its Global Education First Initiative and recommitted to the Millennium Development Goal 2 “by 2015, children everywhere, boys and girls alike, will be able to complete a full course of primary schooling.” Malala didn’t stop – she got involved with Boko Haram’s victims and raised great awareness to the abduction issue, she also sign the Girl Declaration reinforcing her belief that girls’ rights are human rights. Unfortunately, till this day the Taliban still considers her a target. Fortunately, the world already knows, this ain’t going to silence her. “The terrorists thought that they would change our aims and stop our ambitions but nothing changed in my life except this: Weakness, fear and hopelessness died. Strength, power and courage was born. I am the same Malala. My ambitions are the same. My hopes are the same. My dreams are the same.” – Malala.